Habitat, silhouette, bark and buds can all be helpful when identifying a tree in winter. Occasionally a species has one characteristic that is so distinctive, it serves as a diagnostic feature. 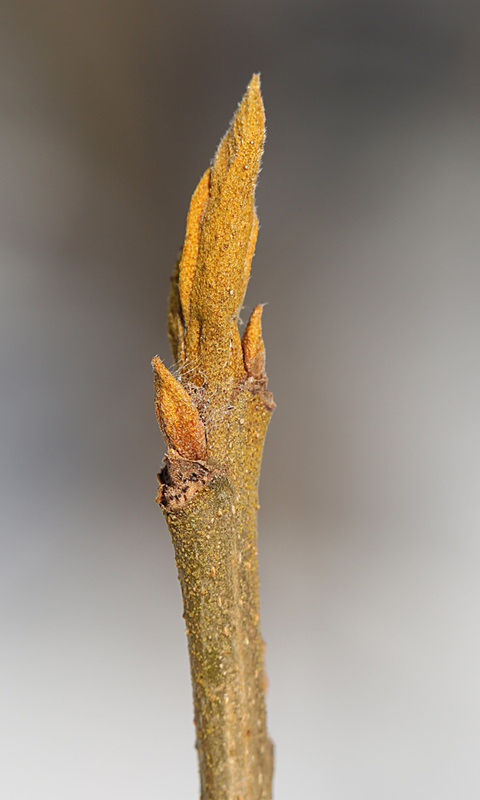 The sulfur-yellow coloring of Bitternut Hickory (Carya cordiformis) buds is such a characteristic. Both lateral and terminal buds have a powdery coating which gives them a bright yellow appearance. Look for Bitternut Hickory on moist lowlands (hence, its other common name, Swamp Hickory) and rich uplands. Although humans find the nut of this hickory inedible, the smoke produced by burning its wood produces the best “hickory-smoked” hams and bacon.